The bell rings and they lock up, then break. They lock up and trade holds. Asuka fights out but Becky hits her with a shoulder. Asuka dropkicks Becky off the ropes. Asuka yells at Becky. Becky comes back and shoves here. Asuka swings with a back-fist but Becky ducks. Becky talks trash now. They run the ropes and beckon side-steps a dropkick. Becky sends Asuka to the mat and tells her to fight. Asuka brings it but Becky goes for a Dis-Arm. Asuka blocks it. Becky with more strikes but Asuka fights back with kicks, taking the legs out. Asuka with a shot to the face and a quick pin attempt. Asuka toys with Becky now, kicking at her, but that just fires Becky up. Becky catches a kick and unloads with forearms. Becky drops Asuka. Asuka goes out for a breather but comes back in as follows. Asuka knocks Becky off the apron with a Hip Attack. Becky ends up coming up and knocking Asuka to the floor from the apron. Asuka pulls Becky out and works here as the referee counts. Asuka rams Becky into the LED board at ringside. Becky sends Asuk in the barrier with a bexploder. Becky brings it back to the ring for a 2 count. Becky beats Asuka down in the corner now. Becky with more offense and another 2 count. Becky works on the arm now. Asuka makes a comeback and ends up applying the Asuka Lock while on the ropes. The referee counts to 5 and the team is broken. Asuka charges in the corner but misses and hits the ring post as Becky moves. Becky uses the turnbuckle to apply the Dis-Arm-Her from the top now. She breaks it after the 5 count. Becky comes off the middle but Asuka catches here in the face with a knee on the way down. Becky comes back with forearms but Asuka just takes them. Becky sends Asuka to the corner but she comes out of the corner with a dropkick that barely connects. Asuka with a Hip Attack in the corner while selling an arm injury. 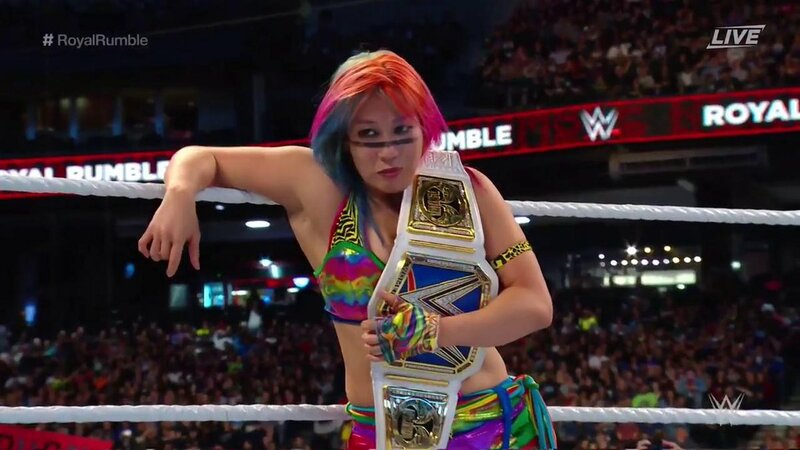 Asuka with a back-fist and more offense. Asuka with a German suplex. Asuka with another Hip Attack for a close 2 count. More back and forth and a 2 count by Asuka. Asuka goes to the top for missile dropkick but Becky moves. Becky drives Asuka into the mat for a close 2 count. Asuka immediately nails a kick to the head for a close 2 count. They face each other on their knees now, trading slaps in the middle of the ring. They fight to their feet, still trading strikes. Asuka unloads but Becky tries for the Dis-Arm-Her. Asuka levels Becky with a kick for another close 2 count. Becky slides out of a suplex. Becky with a springboard kick in the corner. Becky climbs up to Asuka on the top. Asuka rocks here and sends here back to the food. Becky keeps fighting and climbs up. Becky hits a super Bexploder from the top but Asuka kicks out at 2. Fans chant "this is awesome!" now. Becky goes to the top for the leg drop but Asuka moves. Asuka applies the Asuka Lock. Asuka uses the Dis-Arm-Her on Becky. Becky counters and uses the Asuka Lock on Asuka. They break and Asuka levels Becky with a big kick to the head. Becky takes it and pulls Asuka into the Dis-Arm-Her. Asuka breaks free and rolls Becky for a 2 count. Becky rolls Asuka for a 2 count. Asuka with a nice takedown into the Asuka Lock in the middle of the ring. This is from our live coverage of WWE Royal Rumble. To access our full WWE Royal Rumble, click here.